How to enable seeing unique symbols? Currently I am needing to use the several of the Circled Latin letters, that are all displayed as ‘unknown squares’. My understanding was that UTF-8 was needing to display this, but no symbols are displaying. 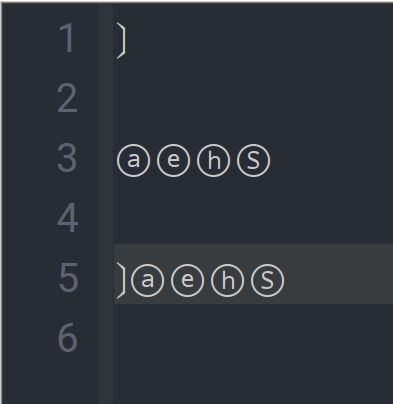 I know the font can support this glyph as Sublime Text can display it, however it displays it in a way that doesn’t confirm to normal use of fonts (the character is bigger than it renders). Is there a way to make these symbols appear? I’m not going to lie, that thread makes no sense to me, the few gems I discovered lead me to create a reply. This unknown (to me) symbol ’〕’ (and other symbols found in that thread) allows me to use the ⓐⓔⓗⓈ symbols in Notepad++ if Notepad isn’t meant to be able to display them why does this symbol allow me to display it, and is that something I can enable that effect document wide so that I don’t need that (or similar) symbol to display symbols I want? sorry, don’t really understand your reply. one doesn’t display it correctly. If I input this symbol ’〕’ I can display ⓐⓔⓗⓈ in Notepad++. Without that symbol, they display as squares. If I remove the first symbol, the circular letters revert to displaying squares. If I paste in the circular symbols, then paste in that first symbol, they squares display the correct symbols. Something about this symbol 〕 lets me display ⓐⓔⓗⓈ, but without that first symbol, they display as squares. would you mind sharing your steps to see if this can be reproduced? These symbols ⓐⓔⓗⓈ revert to squares. If a new line is created, the 〕 symbol is needed again, and can appear anywhere on the line. Missing point, which font you are using? I use symbola for the image posted. Using Symbola shows the symbol regardless of any other symbols. This is starting to sound like a bug, or quirk. fonts on my linux and none of them behave like described. I always see a consistent behavior regardless whether the 〕is used in front or not. For example the font DejaVu Sans Mono on linux show only the rectangles.